As most of you know, I started working on Section 4 in my family room while still finishing up Section 3 on the puzzle table in the basement. Back in April I finally finished Section 3, but until today I had not had time to sit down there and flip the section over and put contact paper on the back. Luckily, Cole took a long nap today, and Derek was willing to play in the basement while I worked to get the entire section flipped over and the contact paper added. 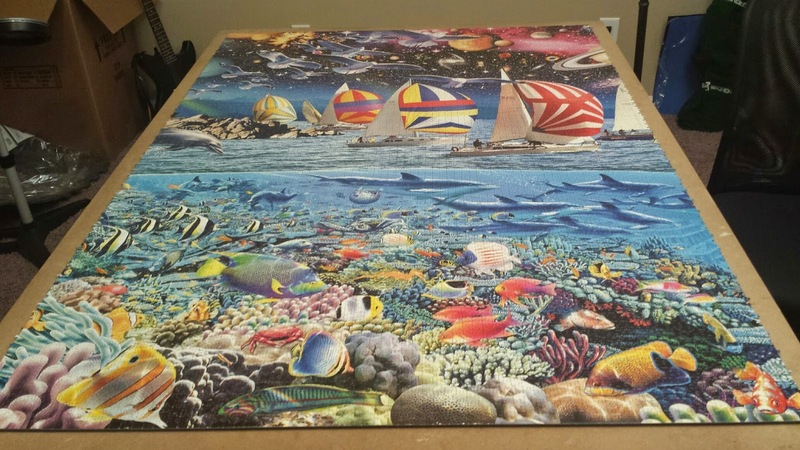 It took a while, and included one small puzzle mishap which cost me the re-work of about 40 pieces, but overall it didn't take too long. 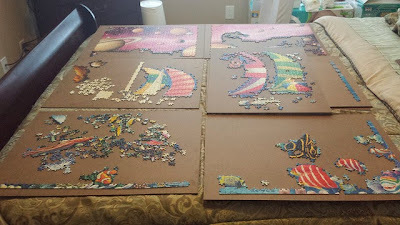 I would say at this point I am pretty close to the 50% mark for the section, which also means that I'm at around the 82.5% mark for completion of the entire puzzle. WOOO HOOO!!!! I'm gonna do it, I'm gonna do it! 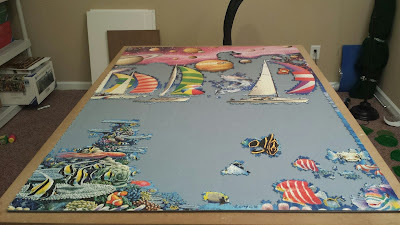 In mid-2013, I was given an opportunity by Artifact Puzzles to receive a free puzzle in exchange for reviewing it and saying something about my experience on the blog. I was very skeptical at first having never experienced a company who wanted to send me something for free and not have some sort of ulterior motive for getting me to purchase the puzzle later. What I didn't realize at the time was that this is becoming a more and more popular marketing trend with the rapid growth of social media. This new strategy benefits both the manufacturer of the product and the blogger who gets free samples of items they would be likely to purchase on their own anyway. So, once I learned that this was not some sort of a scam, I was elated to try my first "product review" and my first wooden puzzle. You can click here to read about my review of The Messenger. I didn't really give another thought to doing more of these types of reviews just figuring that it was a "right place at the right time" type of thing until about a week ago. 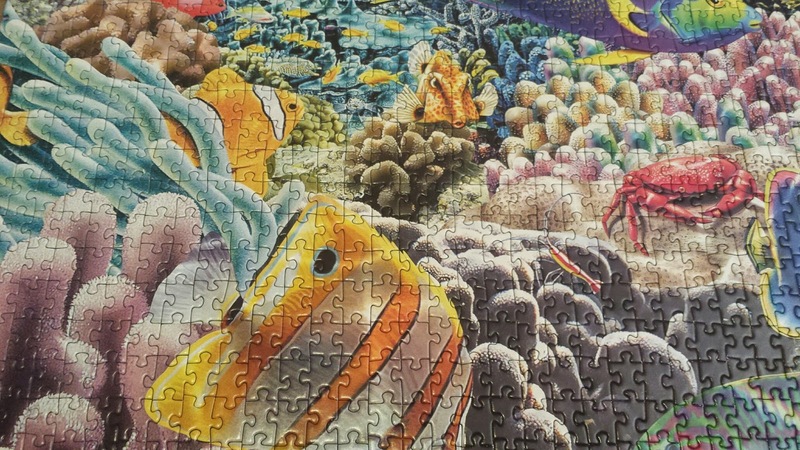 It was then that I was contacted by two more puzzling companies offering to send me one of their puzzles in exchange for a review on my blog. I am shocked and honored to be popular enough in Google searches to be found and approached to do these reviews. 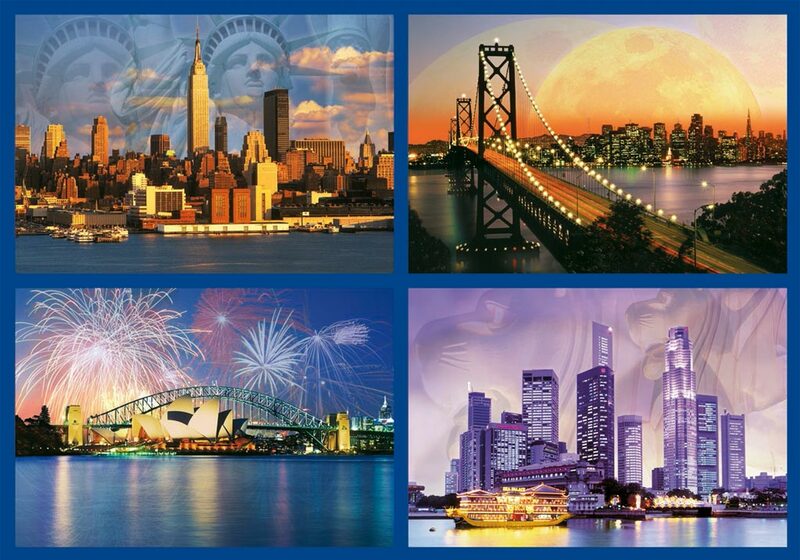 Stay tuned for more information on both of these puzzle reviews coming soon. 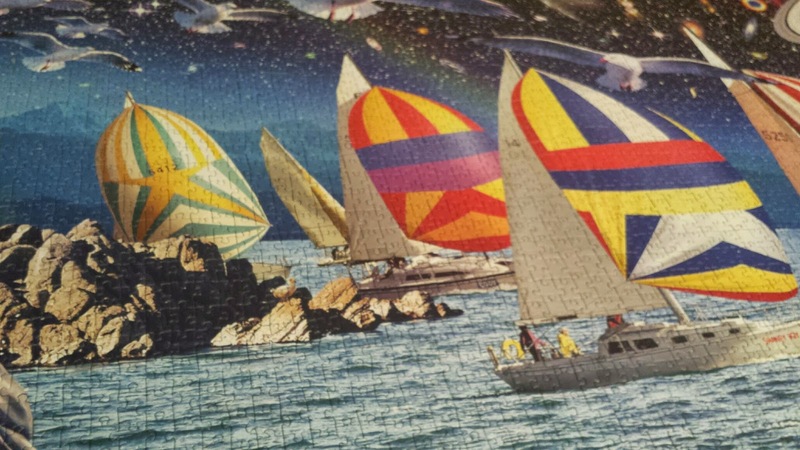 In preparation for writing this blog entry, I went back and looked at two older posts, Life After "Life" and A New York State of Mind where I mentioned a bunch of puzzles that I wanted to get and do after I finished the Life puzzle. At the time I wrote the first one, back in May, 2013, I had none of the puzzles I mentioned wanting to get. Now, just over two years later, I have all of them except two! Wow...I didn't even realize I gotten that far in completing my wish list. The puzzle that was highest on my wish list two years ago was the 18,000 piece Skylines of the World puzzle by Ravensburger. 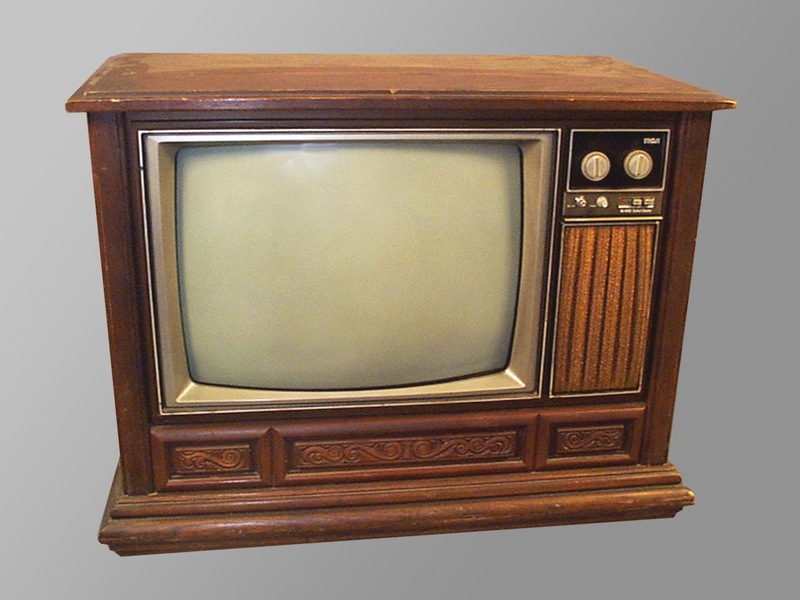 NOTE: This was well before the 32,000 New York City Window was even announced for production. 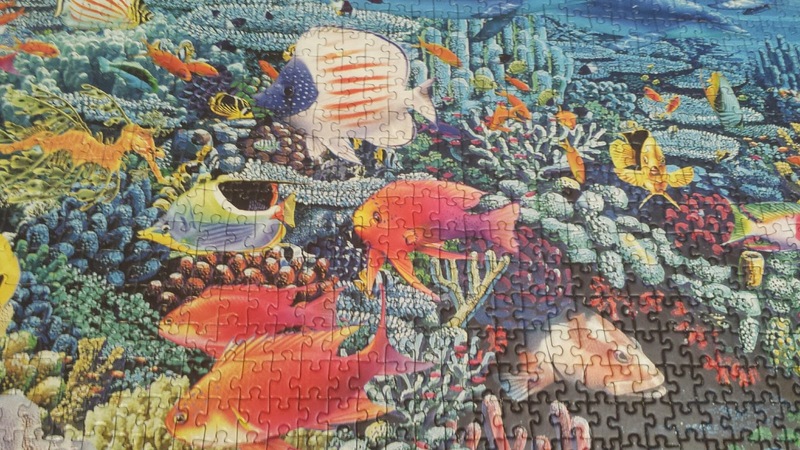 I had been looking for this puzzle for a year or two, and because it was out of print, I was having a very difficult time finding it for a reasonable price. Ebay prices were in the high $200 to $300 range, which I just could not justify. 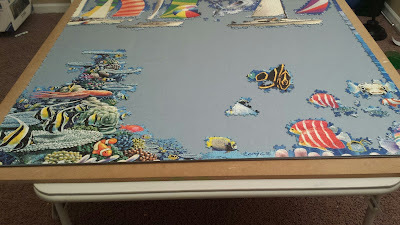 Since starting this blog, I have written a couple of posts regarding my stance on Ravensburger's 32,000 Double Retrospect which took the title of "World's Largest Puzzle"* away from Life: The Great Challenge in September, 2010. As I stated in those posts, I really did not like the artwork on this new record holder AT ALL initially. 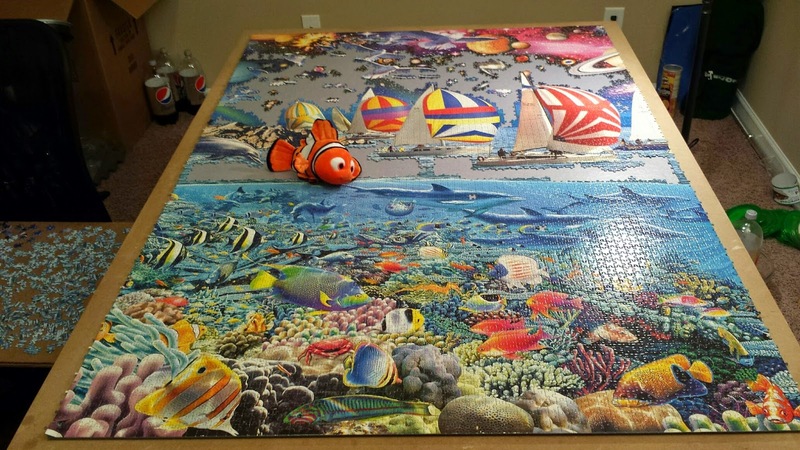 Then, as I started to see pictures of other people putting the puzzle together, including this great blog, it started to grow on me just a little bit. 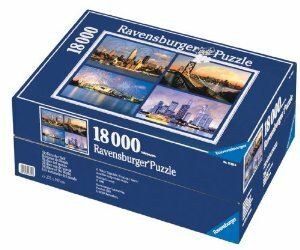 At some point over the last few years, I decided that I would consider making this puzzle to sell or donate, but ONLY if I could get a really great deal on it somewhere. It has been retailing for anywhere between $170 to $270, and because I wasn't in love with the image I knew that price was too steep for me. I really didn't figure I would get it anytime soon, if ever, as there are just so many other large puzzles out there that I love so much more. I knew I'd rather spend my puzzling money on those for sure. The seller let me know she was going to be in the San Diego area for Mother's Day weekend! Well, it just so happens that Randy's cousin Matt recently relocated from New York to San Diego. Hmmm...the cogs were turning at this point, and I thought, "Could this really work?" So, I went back and forth with the seller and Randy's cousin to see if we could work out a way for him to meet up with her and get the puzzle and then store it for me until he made his next trip out this way, which I knew was going to be at the end of the year for the holidays. So lo and behold, this is how I came to be the proud owner (though not yet possessor) of a brand new, factory sealed copy of Double Retrospect for only $25!! YAY ME! And a big shout out of thanks to the seller, and her sister! 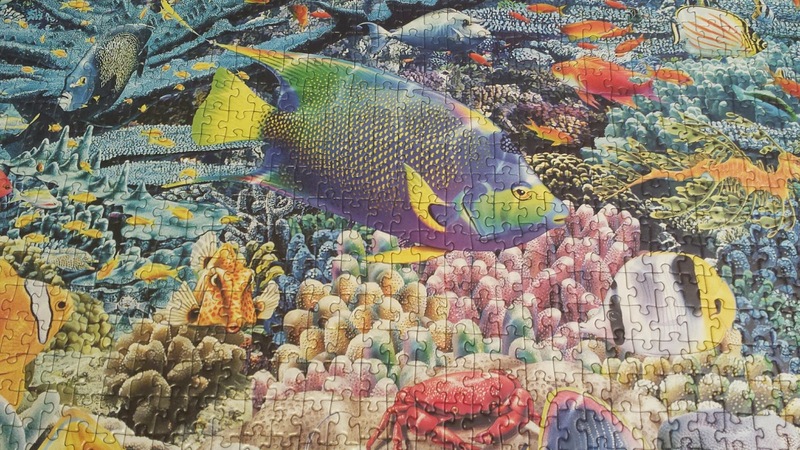 *Editor's Note: Double Retrospect has since been replaced as the World's Largest Puzzle by Educa's 33,600 piece Wild Life. 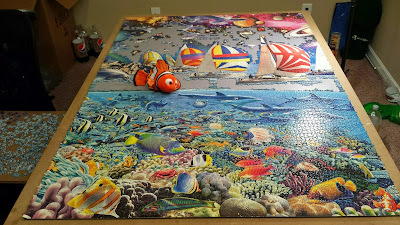 Wow, April really must be my month as I have completed each section of the puzzle in the month of April so far. Though, I am truly hoping to break that pattern with section 4 as I really do not want to be working on this same puzzle a year from now. As much as I have thoroughly enjoyed every minute I have spent with this beautiful beast, I am ready to move forward with something new. 1. 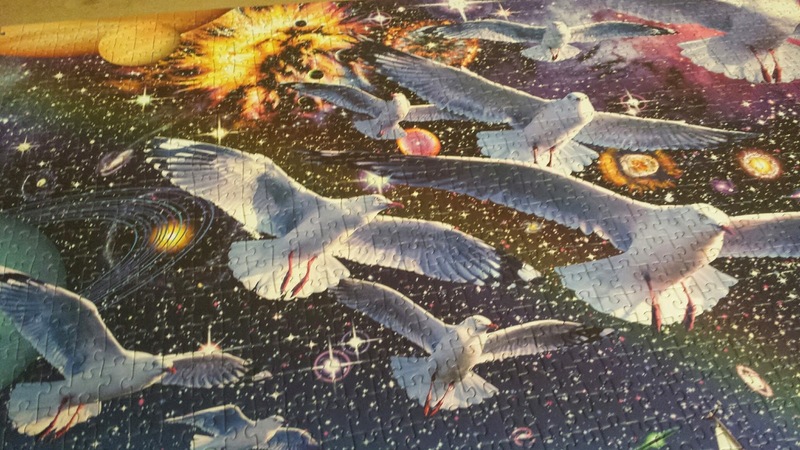 I have never been a fan of birds, but after completing this section with all the seagulls at the top, I can officially say, I HATE BIRDS!!! 2. I still seem to save some of the hardest areas for last. 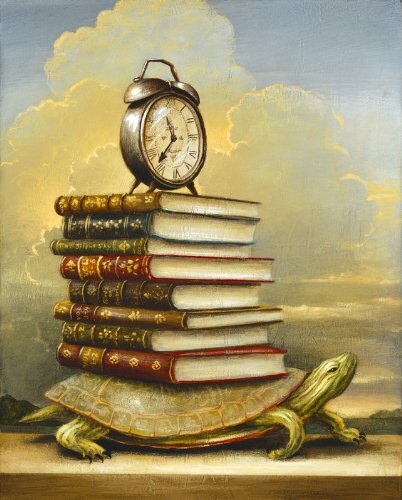 I am not sure why, but it seems to keep working out like that each time. 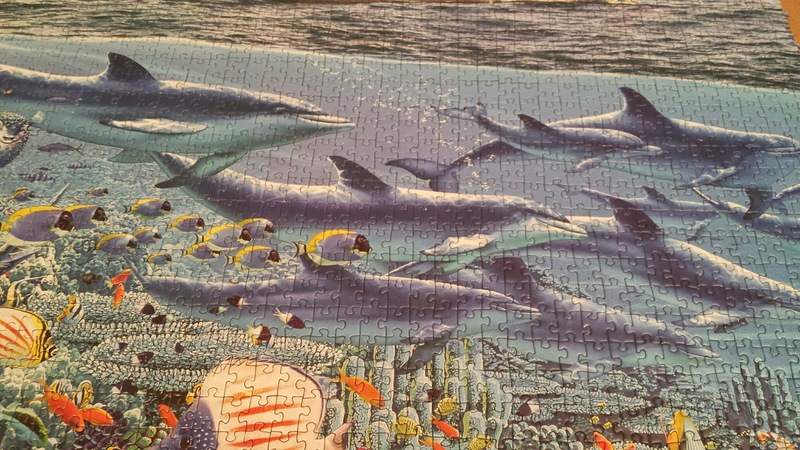 This time it was the seagulls, the dolphins, and the surface of the water. By comparison, the surface of the water was far easier than either the birds or the dolphins. 5. April is a good month for me - who knew! I don't know if I'm going to know what to do with myself when I finish Section 4, but I am sure looking forward to finding out! Thanks for sticking with me all these years. I can see the finish line coming into sight now. Holy Moly! 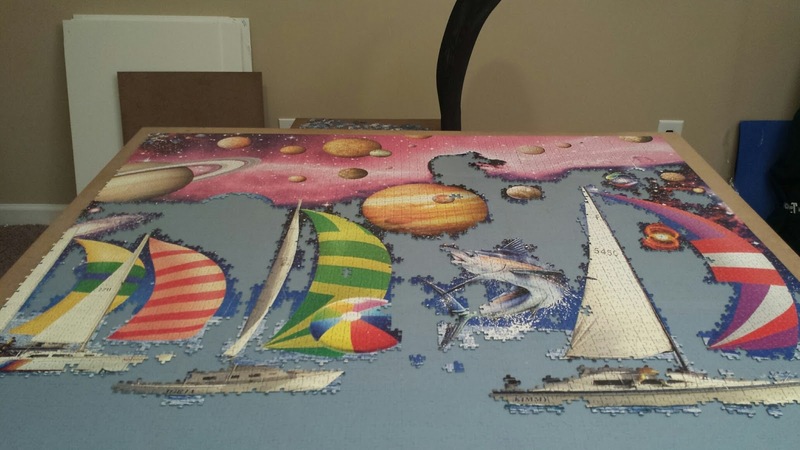 How on earth did I get this far into 2015 and not post any updates on the puzzle blog?! 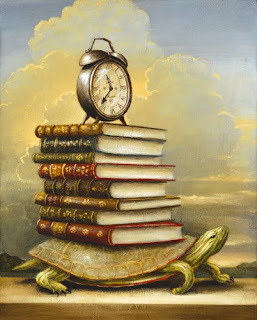 There really is no excuse for my lack of blogging so I won't bore you with my litany of ready excuses. Instead I will just dive in and show you pictures of the latest status.